Hostgator is holding a huge promotion for one day on all its web hosting plans from 12:00 AM – 11:59 PM CDT TODAY (September, 19th, 2013). 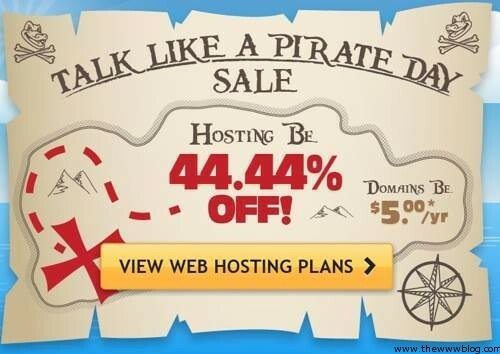 This plan is based on the “Talk Like a Pirate” day where the web host is going to provide a whooping discount of 44.44% on the web hosting plans. The promotion doesn”t include offers for only the hosting, but also for the domains which would be available for as low as $5, and a standard shared hosting package can cost just $2.76 per month, which is comparably quite less than the $4.95 which you pay normally. I haven”t been able to get any info whether this would be a online casino promo for only the shared hosting, reseller or all the other hosting packages which include the VPS hosting and the dedicated servers, so later if we find this was just for the shared hosting and you were looking for something else, don”t worry because Christmas is not very far and there would be a few excellent offers from not just Hostgator but most of the web hosting services on Black Friday and the Thanksgiving, but we recommend Hostgator for its services, and been using it since half a decade now. Right now, there is one more coupon code that is working perfect for the first month discount on web hosting plans, where you can get it for $0.01 dollars, which is just to make sure you are adding your card for the future subscription payments. The coupon is BIGOFF1CENT. Hostgator comes up with some offers on special days, and it was just a couple months back, in July when they were providing 30% discount on all their web hosting plans. Before that, it was the last year”s Cyber Monday deals and even Hostgator”s 10th Anniversary where they offered huge discounts, and this is no marketing play because it”s the standard prices on which they provide the discount directly.